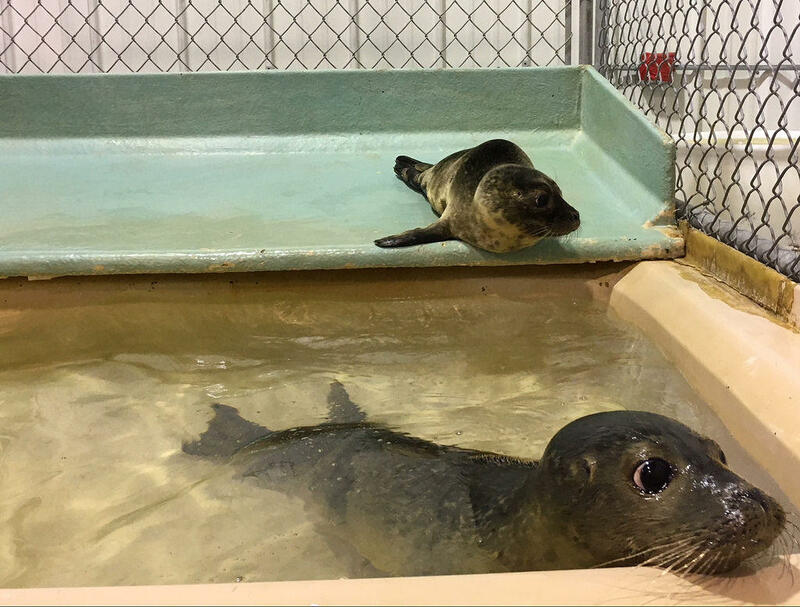 Rescued seals regain their health at Marine Mammals of Maine, in this photo taken August 23, 2018. YORK, Maine - Maine environmental officials are considering using composting to manage seal corpses left behind from mass die-offs. The Portsmouth Herald reports over 600 dead seals have washed ashore along the coastline in Maine, New Hampshire and Massachusetts since July. The National Oceanic and Atmospheric Administration said last month an outbreak of distemper caused the deaths. The Maine Department of Environmental Protection has asked towns to create special composting bins for the seal carcasses. DEP environmental specialist Mark King says the leaf and mold compost areas are easy to create and maintain. Towns including Ogunquit, Wells, Yarmouth and Kennebunkport have all devised protocols for corpse removal. Marine Mammals of Maine Director Lynda Doughty says the state can't stop the distemper virus but it can prepare for more deaths.